This clearly falls into the “no surprise” category as Columbia Pictures has confirmed that Dan Brown’s novel, The Lost Symbol, will get the big screen treatment. The third film in the Robert Langdon series, this time we find Langdon traversing the mysteries of the Freemasons in Washington D.C.
Scribe Steven Knight is set to adapt the screenplay from the novel which sold over 1 million copies in the first day. Knight’s other credits include drafts for Martin Scorsese’s upcoming Shutter Island as well as The Chronicles of Narnia: The Voyage of the Dawn Treader. While both Brian Grazer and Ron Howard are set to return no word on whether Tom Hanks has committed to the project. That said, I find it highly unlikely that he would not reprise the title role of Robert Langdon. While the second installment of the series, Angels and Demons, performed less then The Da Vinci Code, $486 Million compared to $768, the resounding popularity of The Lost Symbol is sure to help. Moreover, The Da Vinci Code was wrapped in controversy which had people eager to check out what all the fuss was about by seeing the film. Angels and Demons had little to no controversy surrounding it. Regardless, a $400 + million take is by no means a failure. I, for one, was not blown away by either film. However, they were serviceable thrillers with solid production value. While all these stories involve enigmas at some level, there’s no mystery as to why they’re popular and I’ll certainly check out The Lost Symbol when it hit theaters. Screenwriting duo Roberto Orci and Alex Kurtzman (Star Trek) recently told Sci Fi Wire they turned in their draft of Cowboys & Aliens on Aug. 5 and are awaiting feedback on their adaptation of Fred Van Lente’s graphic novel. Van Lente’s graphic novel deals with feuding frontier settlers and Native Americans in the Old West who team up to fight extraterrestrials. Orci and Kurtzman have stated that they put their own spin on the adaptation, and now producers Brian Grazer, Ron Howard and Steven Spielberg and potential star Robert Downey Jr., will have the opportunity to voice their opinions. “We’re just literally waiting to hear if they hate it or what,” Orci said. 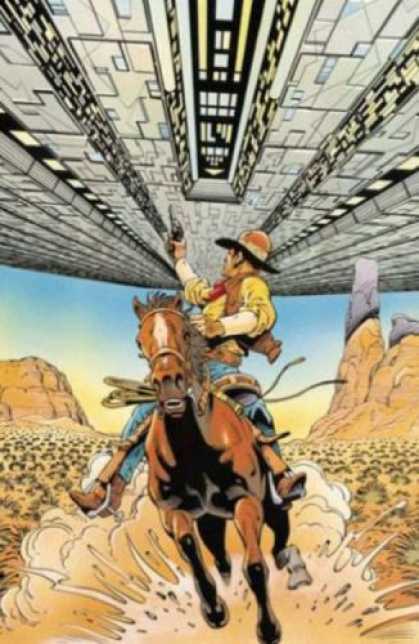 Cowboys & Aliens is tentatively slated for a summer 2011 release.